Wait until you have a full load before using your automatic washing machine. Savings: 33 gallons. Before washing badly-stained clothing, soak them by hand. Savings: 2 gallons. Don't hose down your sidewalk, patio or driveway with water. 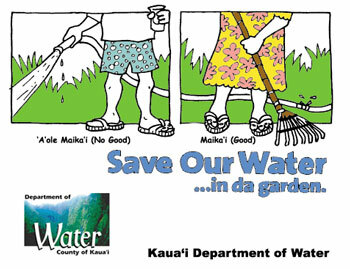 Use a broom or rake for cleaning, and save hundreds of gallons of water. Savings: up to 10 gallons per minute. Use a pail and sponge instead of a running hose to wash your car. Or, use a hose nozzle that shuts off water when you are not wetting or rinsing the car. Savings: up to 10 gallons per minute. Make sure outside water taps are turned off when not in use, and check for leaks in faucets, property pipes and plumbing fixtures at least once each month. To check for leaking pipes, listen for the sound of running water, or look for unexplained ponding of water near property pipelines. Close all water outlets (faucets and taps) and check your water meter. Lift the meter cover and observe: if the reading dials show movement, you may have a hidden leak that needs repair. Savings: thousands of gallons per month!